The QuEChERS (Quick-Easy-Cheap-Effective-Rugged-Safe) sample extraction method was developed for the determination of pesticide residues in agricultural commodities. While originally QuEChERS had been developed for plant matrices, the technique has since been adapted for many additional matrices such as honey, as well as several other applications. 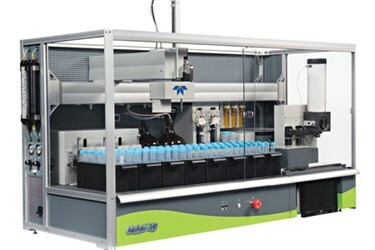 With the rise in popularity of this extraction technique and due to the reliability of its multiresidue methods, it has driven the need for automation of the QuEChERS extraction to increase productivity and throughput. The AutoMate-Q40 streamlines the QuEChERS method by adding Acetonitrile (ACN) and buffering salts, shaking, mixing, centrifugating the sample, transferring to a dispersive solid phase extraction (d-SPE) tube, measuring and delivering the extract. The aim of this project is to validate the extraction performance of the AutoMate-Q40 by monitoring neonicotinoids and other pesticides in honey. The target residues were determined by liquid chromatography tandem mass spectrometry (LC-MS/MS).